The Wedge Cup provides you with a safe alternative to a regular cup or drinking glass for those with dysphagia or other swallowing disorders. An invaluable drinking aid for a wide variety of people with injuries or limited muscle control or decreased strength, those with weak or limited range of arm or upper body motion and those recovering from arm or neck injuries. 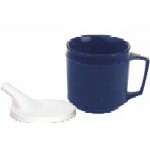 This dysphagia cup is perfect for home use or for use in healthcare facilities. 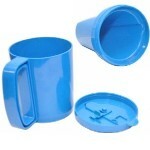 The Wedge Cup is the best way to drink any liquid easily and safely! A eight ounce version of the nosey cup. Translucent plastic cup has a textured grip surface and a special cut out for the nose area to allow for easy drinking without having to tilt the head.